Volunteering with TEECH can take many forms. You can choose to fundraise, come along on a summer trip and get 'hand's on', help us deliver shoeboxes at Christmas or many other ways. The picture shows the volunteer's on the 2015 summer project in Bolduresti, Moldova. ​Volunteering for a summer project involves a 2 week trip to transform the lives of a community. The charity focuses on installing toilet facilities into orphanages and schools where they do not have any indoor toilets, let alone flushing ones. The pictures below show the common toilets, or 'holes in the ground' used by the majority of Moldovans. We feel it is important for children and the community to have basic hygiene facilities, so why not join us and help. We ask volunteers to cover their travel, hotel and food expenses (whilst on location) which is £500, plus we ask volunteers to raise £200 which goes towards funding the project itself (plumbing, electrical and carpentry supplies etc), therefore a total of £700 per volunteer. 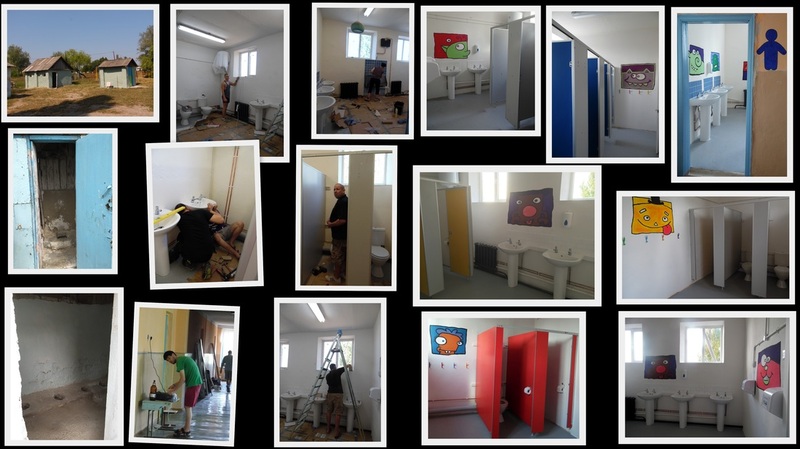 Below is a collage of pictures produced by volunteer Michelle from the 2016 project in Ivancea, Moldova, showing the classrooms being transformed into bathrooms and the outside toilets! This picture shows the girls toilets installed with cubicles into a school. This room along with one for boys was completed in just seven days at the school by a team of 26 volunteers. If you are interested in getting involved then please contact us for more information on the annual August trip/challenge! Thank you to Dave Astbury who created the 2016 t shirt on his first adventure with TEECH. Watch our video below which gives you an insight into what TEECH do and how a trip is undertaken. Volunteering can also give you the opportunity to be creative. Even if you have never painted before other volunteers will have and can get you involved in creating fantastic murals inside and outside of schools (or other buildings we work on). The local children also come along to help and can be part of the transformation of their school and this is also a brilliant chance for you to meet and work with the locals you are helping. The next TEECH project trip will be in August 2018......contact us for further details.